Your ticket to Pandora just got quite a bit cheaper, but for one day only. If you had some Borderlands titles on your holiday wish list but your friends and family just didn't come through for you, Microsoft may be your new best friend. Today's "Countdown to 2013" daily deal on Xbox Live includes both Borderlands and Borderlands 2, and the Borderlands 2 Season Pass. The debut Borderlands title is marked down to just $9.99, from its normal $19.99 price, while Borderlands 2 gets a price cut from $59.99 to $39.99. Both titles are offered as Games on Demand downloads, so you'll need a decent amount of free hard drive space if you want to take advantage of the temporary discounts. 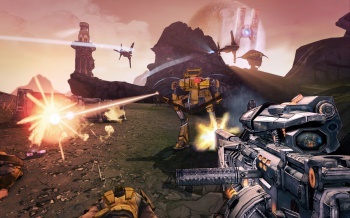 The Borderlands 2 Season Pass is marked down from 2400 MS points to 1800, allowing you access four DLC content packs. Two of the story-based add-ons have already been released - Captain Scarlett and Her Pirate's Booty and Mr. Torgue's Campaign of Carnage - and two more on still on the way. The next release will be Sir Hammerlock's Big Game Hunt on January 15, 2013.